The Al Nakheel Tower is a prestigious building, dominating the centre of Riyadh, off King Fahad Road, near King Abdullah financial district. One of the most prestigious projects in the Kingdon of Saudi Arabia, the 26-floor tower houses a luxury hotel with VIP penthouses. CCL was selected because of its alternative design solution and proven experience in the region over the last decade. The demanding architectural design and complex geometry, which demanded large spans, ruled out conventional frame methods. An alternative post-tensioned design was offered, which not only allowed the desired large spans, but also delivered time and cost savings, even on this complex structure. The post-tensioned design allowed internal columns to be removed, thus giving the 14 m span required, which would not have been achievable using a conventional reinforced solution. The inclined columns and slender design could be accommodated using finite element design and the flexibility of post-tensioning construction material on site. 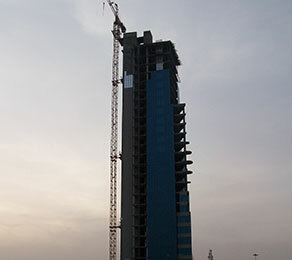 This was the first tower in Riyadh where a flat-slab post-tensioned solution was used, which showed the benefits that can be achieved using this method. The project was completed on time and on budget. The benefits of using the CCL post-tensioned designs provided a faster building schedule than anticipated, by allowing shuttering to be removed earlier and deployed more quickly within the building.